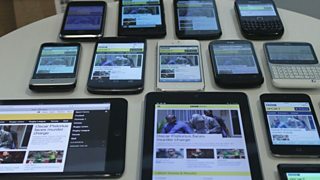 Hi I’m Keith Mitchell, technical lead for BBC Sport’s mobile services including the new responsive mobile sport web site and the native BBC Sport apps. I know from the comments on Lucie McLean’s last post that many of you have been waiting for this so I’m very pleased that from today Android users can get access to BBC Sport through an app. 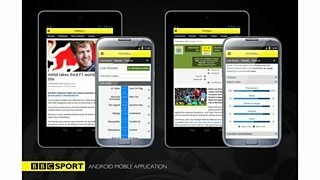 The launch of the BBC Sport app for the Android platform today is another important step in serving sports fans across multiple platforms. In this post I will summarise the key features relating to the Android release and provide a glimpse into what to expect next from us. Previous posts by Ben Gallop and Lucie McLean described the main features of the mobile sport site and the iOS app. Top stories and breaking news from a wide range of sports. Live text commentaries on all the big football fixtures, from all the major events and the daily Sportsday live. A whole new football section which includes fixtures, results and live scores for each competition and league. Pages for every UK football match and the latest football transfer gossip. Live video streaming and video clips accessed through media asset pages. The ability to share pages with your friends, through email, Facebook and Twitter. Since the launch of the iOS app in the UK last month we have added team pages and media to our mobile web site which are also available in the Android app and the UK and International iOS apps. The football team pages include top stories, links to team specific fixtures, results and competitions in which they compete. Over the coming weeks we’ll add more functionality to these pages. We now support the playback of audio and video clips and live video streams within the Android app on versions of Android based around 2.2 (Froyo) and above. For some handsets this means that unfortunately video playback may not be possible and for some devices this will mean the installation of the BBC Media Player. For full details on what devices we support please see our mobile media frequently asked questions (FAQs) page. One additional benefit to the release of the Android app is that it scales to small tablet devices. We have ensured that the app scales well to support newer smaller seven-inch tablets like the Nexus 7 and the Amazon Kindle Fire family of devices. A version of the Android app will be made available through the Google Play Store and Amazon marketplace very shortly but in the meantime you can experience the mobile optimised web site. Our new mobile sport site and native apps herald the beginning of a range of changes you should expect to see over the coming months on these platforms. For the sport mobile site our ‘responsive design’ and ‘mobile-first’ approach allows the audience experience to be tailored to the capabilities of the device being used to view the site. What you will notice is that the same web-based text news, commentaries, fixtures, results and live scores content is delivered in the browser and in the app to all mobile devices we support including Blackberry and Windows Mobile. Our development of sport apps has focussed around the Android and iOS platforms as they account for approximately 75% of smartphones in the UK but we will continue to review the smartphone market. Following our experiences of developing the native iOS and Android apps for the London 2012 Olympic Games we have continued to follow the hybrid native app approach for our sport apps. By doing this we are able to surface the same content within our apps using WebViews. This allows the native apps to contain every feature found on the website and ensures that everything we do for big sporting events, such as the World Cup, are always available in the app in future. Being able to deliver and support such a wide variety of devices across both web and app creates a significant challenge for our engineering and test team. To meet this we have a behaviour-driven development (BDD) engineering process focused around code quality, maintainability and most crucially testability. Before I go I thought I’d reveal just a couple of features we are currently working on and which you should expect to see shortly. These include customisable quick links for the main navigation, team customisation and home screen widgets. We’d love to hear what you think about our new Android app so far and the features now available across all mobile platforms. Keith Mitchell is the technical lead for BBC Sport mobile.